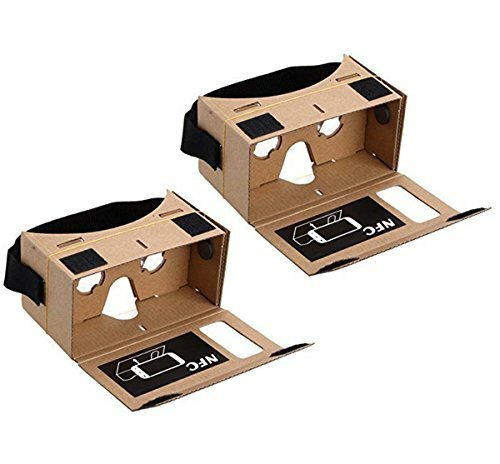 Blingkingdom - (2pcs in Pack) Google Cardboard Headset 3D Virtual Reality VR Goggles for Android Smart Phones iPhone + NFC and Head-strap by BlingKingdom at Kode Fu Guru. MPN: Google 3D Glasses-1*2. Hurry! Limited time offer. Offer valid only while supplies last. Works with most iOS, Android & Microsoft smartphones (with up to 5.4" in size) that are running Android 4.1 or later and have a built in Gyroscope. Turn your smartphone into an amazing Virtual Reality Headset with this complete DIY kit! This kit even comes with the NFC tag and Magnetic for the full experience and functionality with your Smartphone. If you have any questions about this product by BlingKingdom, contact us by completing and submitting the form below. If you are looking for a specif part number, please include it with your message.